This is one of my favorite pattern that I've ever made... 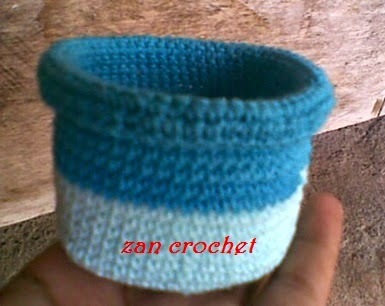 Although it's not a perfect pattern but it so easy to crochet. Note: This project is working in continuous rounds, do not join or turn unless otherwise stated. Mark first stitch of each round. Stuff firmly. Stuff little by little and form so you shape the flower center nicely. Start stuffing when you have made a few rounds of the stem (not too many though). I tend to overstuff, but when stuffing the stem don't stuff so tight the filling might shine through. Fold round 29 and 30 out, then sews it to row 28. Fold it once more but don’t sew it. Sew the leaves between the ball of earth and stem. Sew them on the left and the right side. Use photo as guide. Sew the other side of the stem to the back of flower. If your flower can’t stand up well you can add the wire into the stem. 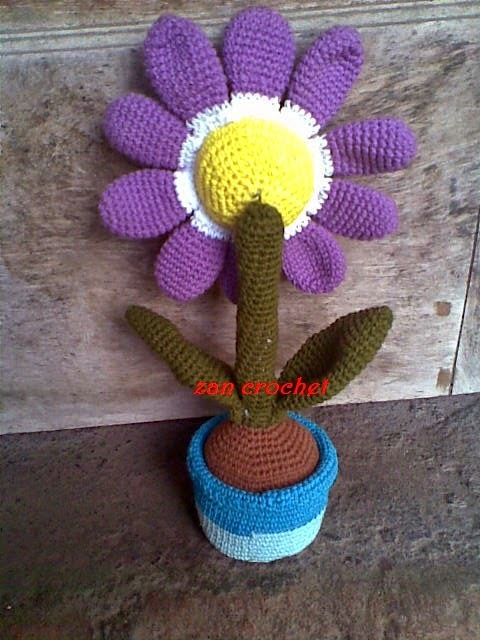 Note: To make your pot have a good foundation you can add a round piece of milk carton then cover it whit crochet. Work R1-R8 of pot steps... cut the yarn and leave long tail for sewing... Sew that cover into the pot.. This pattern is an original by me, Zan Merry. Please do not claim this pattern as your own. If you wish to share this pattern, you may link this pattern but please do not reprint it to your site. You may keep a copy of this pattern for personal use but you may not sell this pattern. 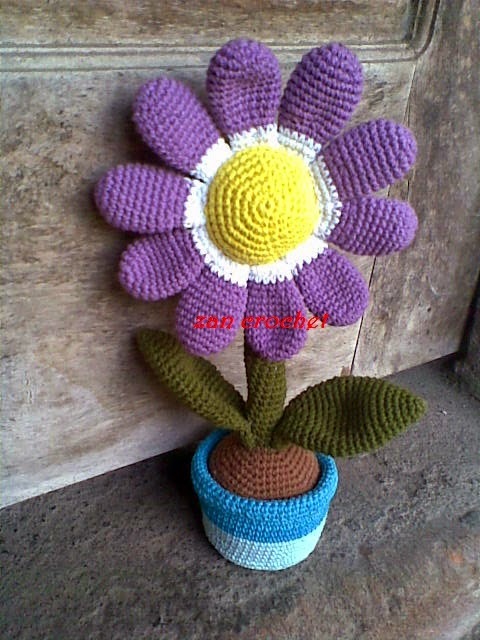 You can sell the items that you made from this pattern as you credit me as the designer. 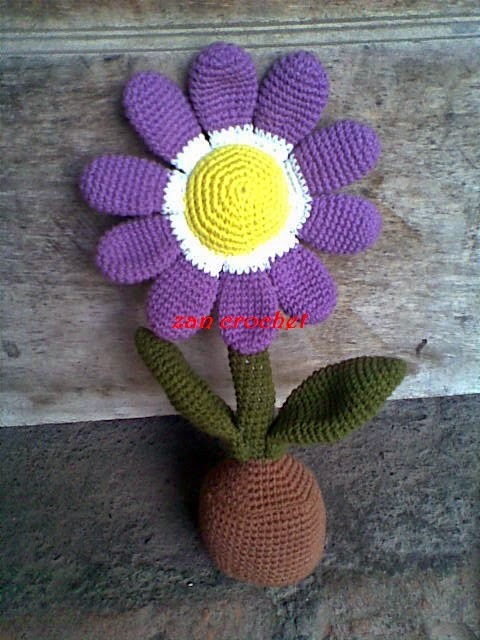 thanks for sharing :) its very nice... just a note that you missed step 3 in flower center.. Thank you for sharing your beautiful pattern! 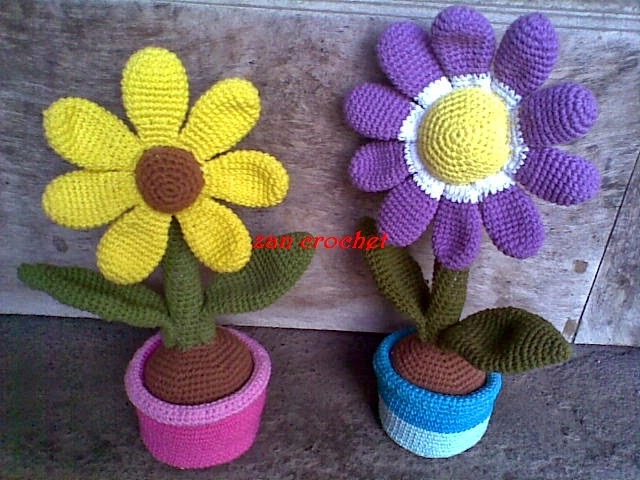 I'm going to make a couple for my mom and my sister. My version came out perfect. Loved doing it. Love itmade one for each of my granddaughters. I added a happy face to the center. Thank you for sharing. Mba untuk stemnya soy bisa tegak diisi apa? Kawatnya yang ukuran brp mba? Mbak aku bingung di bagian pot yg ditambah karton, gmn itu ya?